The article below, written by Sandy Arons, discusses the hidden costs of divorce and ways you can minimize those costs. Refer to our page on services for more on how Arons & Associates exposes these hidden costs and helps you reduce the expenses of your divorce. This article appeared in the November 2010 issue of the TAPM Mediation News (A trade journal published by the Tennessee Association of Professional Mediators). Did these facts surprise you? Let’s look at these divorce statistics to understand why they occur. Mothers frequently want to keep the house and forego retirement money and/or other assets. Yes, ladies are nesting creatures. When scared, their instincts are to keep the family together and minimize the disruption in their children’s lives. Most women have not completed a detailed list of living expenses and therefore believe they can afford the house. They forget that ovens stop working, that trees fall over in the yard, that health insurance deductibles need to be met and cars need new timing belts. Women frequently keep a house they cannot afford and then plunge into debt — and many times bankruptcy — trying to keep a dream alive. In my practice, I’ve created a complete list of living expenses — household, medical, transportation, child and personal expenses — which contains 125 items. Most attorney budgets have about 30 items. It is not realistic to expect a divorcing person who is emotionally rattled to think clearly enough to assemble an accurate budget without guidance from a divorce financial counselor. If routine monthly expenses are underestimated by $300, annual expenses will be over budget by $3,600 ($300 x 12). That equals $18,000 ($3,600 x 5) over a five-year period. While calculating correct living expenses seems trivial, that calculation is the foundation of your financial house. If monthly expenses are not correct, it is similar to a crack in the foundation of your home. Another common error during divorce is ignoring the impact of inflation and increased expenses as children get older. For example, if your monthly expenses currently are $4,000 and we assume a 5% cost-of-living increase annually, next year your expenses will be $4,200-a-month. The year after that your monthly expenses will be $4,410. The table below shows why you need to consider the effect of inflation on your budget / alimony request and divorce settlement. 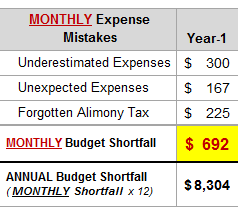 This example shows how 5% annual inflation alone can increase monthly expenses an additional $862 in just five years. You may be able to afford the marital house today but can you afford it tomorrow? Additional financial blunders occur during divorce if women do not know that they will pay taxes on alimony and don’t include those taxes in their monthly expenses. If your monthly budget does not have a line item for alimony taxes, your divorce budget could be seriously underestimated. Compare this statistic to the fact that only 18% of widows live below the poverty line. Deductive reasoning suggests that divorce settlements typically include women keeping their marital homes in lieu of retirement funds, choosing low-paying jobs that allow them the flexibility to care for their children, and just getting by. Because women do not have the opportunity to contribute much to retirement accounts post-divorce, they enter their retirement years relying on Social Security. Lower earnings result in lower Social Security benefits. During retirement women can always sell the house; that will give them some funds. But those funds did not have the chance to grow tax-free over time. At 7.5% interest, money will double in about 10 years. While their ex-spouse’s IRA was probably doubling, the equity in the house did not. And the IRA did not need to be painted or repaired. Has your attorney / lawyer discussed this issue with you? Are there restrictions on distribution of the account to a spouse / ex-spouse? If my ex-spouse dies before they retire, can I still receive my portion of their pension listed in the divorce settlement? I’ve seen too many cases in which the divorce settlement divides the retirement benefits, but the spouse never receives the money because the plan had restrictions on how the funds could be divided. Don’t make the mistake of assuming your divorce attorney / lawyer has carefully reviewed the retirement accounts and pensions. At Arons & Associates, we specialize in reviewing retirement accounts / pensions and educating our clients / their divorce attorneys if restrictions apply. This analysis should be completed prior to scheduling mediation. Men make plenty of their own financial mistakes during divorce. However, men typically earn more than their wives so the negative impact of their decisions is blunted. With male clients it is equally important that they have a complete list of living expenses and understand tax issues (including, but not limited to, capital gains taxes on investments sold and penalties for early withdrawal from retirement accounts.) Otherwise, good intentions or a guilty conscience could cause the husband to agree to a divorce settlement that he cannot afford. Then, he and his ex-spouse will be back in mediation or court within two years and the drama / expense of divorce continues. …the immediate impact will be monthly expenses that are $692 more than planned and $8,304 ($692 x 12) of added expenses in the first year. In five years, a 5% annual inflation rate will add $862 -a-month in unplanned expenses by Year–5. The monthly budget shortfall will increase to $1,554 and the five-year total shortfall will be $66,750. These calculations provide a concrete example of how small, short-term mistakes can have big, long-term consequences and they validate the statistics mentioned earlier in this article. or lost funds due to unknown capital gains taxes. Clearly, the financial issues of divorce, such as those dealing with retirement funds and tax treatment, are complex. A complete discussion of these issues will be the subject of Part II of this article. Emotional costs you and your family endure during the divorce process. Hidden costs including the amount that you underestimate your monthly living expenses and the funds you may unintentionally give your soon-to-be ex-spouse or the IRS. One way to reduce the emotional costs of divorce is to minimize arguments. In our experience, if both spouses understand the financial issues, arguing over money quickly dissipates and the emotional costs to the families are significantly reduced. Arons & Associates strives to educate clients and keep the emotional costs of your divorce to a minimum. The best way to eliminate hidden costs is to take advantage of the financial expertise of Arons & Associates Divorce Planning. The insights we provide help our clients and their attorneys avoid costly errors that could result in foreclosure or financial ruin post-divorce.